Reid: My name is Leatris Faye Boehmer Reid. B-O-E-H-M-E-R. It's pronounced "bay--" "bay-mer." And I was born in North Dakota in 1930. Bauman: Just before we get started on that, I just need to get the date on here, make sure we have everything. And so we're recording this on August 27, 2013. Bauman: And we're recording it in your home in Walla Walla. Bauman: Yeah, let's have you talk about your family and how your family came to White Bluffs. Reid: I came here in June to White Bluffs, Washington in 1935 or '36. I'm pretty sure it was '36 because I had my sixth birthday there. Bauman: So you said you were born in North Dakota and moved to White Bluffs in 1936. Why did your family leave North Dakota and head to White Bluffs? Reid: Well, we had a terrible Depression, as you know. And I was a Depression baby, and we just simply weren't—there was no work, there was no money. We just simply had to get out of there. We lost a little boy at two and a half with what they call membranous croup at the time. But it was actually, what it was was that awful--oh, kids have it. It's asthma, terrible asthma. And he just couldn't make it. And I think it just broke my mother's heart. She had just lost a baby. So then I became the baby. But I think I was almost six, so--She had written all over Washington, Oregon, because she knew that there was fruit there. And there was food, and the temperature was reasonable. And so she wrote all the little towns that she could find in Washington and Oregon to find out what they did there, what they grew, and what the chances were of people surviving. And she got one for Mr. Reierson that owned the grocery store in White Bluffs, and one from the man who had the bank. And I can't remember his name. But she got glowing letters about the fruit. She got glowing things about that there was work. There was packing sheds, there were alfalfa fields to take care of. And there certainly were. They didn't stint on it and it was not exaggerated. So that's how we came to be there, and find it we did. It was exactly like they described it. It was probably the best thing that ever happened to us, because we would have starved. We had no money even to pay for that little boy's doctor bill that we left. So then I was the littlest one, and we had six left. Reid: Well, my oldest sister--who I dearly love and still is alive and I'm glad--is 10 years older than me. And her name is Dorothy Lorraine Boehmer-- "bay-mer"--Foyer. And she lives in Everett, Washington, and she will also probably make a statement to you. But she's my oldest. And then I had a sister LaVonne. I had a sister named Helen and a brother named Virgil, all of them the same name, Boehmer. And I had a little brother. I had a sister named Darlene also. And she didn't live at White Bluffs. She stayed with my great-aunt and uncle in Minnesota because they had no children and they wanted to educate her. She was very smart. And she had been treated badly at school in North Dakota, and she didn't want to go back. And they were visiting us. So my mother said, well, you could have her for a year. And of course she--they became so attached to her. And she loved them dearly, and they were good to her. And they did visit us at White Bluffs. And they liked White Bluffs when they came. But it was the best thing that ever happened to us to move to White Bluffs. They had work in packing sheds, like I say. They had--the kids were very receptive to us. And everybody there just opened their arms. Bauman: I wonder if you could describe the place you lived in White Bluffs. Reid: Well, we lived at Lulubelle Johnson's house, and we were buying it from her. But we never realized any money out of when it sold to the government. But Lulubelle Johnson had a son named Ford Johnson because Lulubelle Johnson was a niece of Henry Ford, made the automobiles. And we stayed there at that house and it was just—it was wonderful. We had good neighbors, fruit orchards all over. All over. When they said that you will find all the fruit you want, they really meant it. Bauman: And so what sort of fruit was on the farm you grew up on? Reid: Oh, we had--we grew alfalfa. If you didn't grow alfalfa, you grew fruit. But we had a good well on our land, and alfalfa was a good-paying crop. And of course, we had a cow. And if we had too much alfalfa, we could sell it. So it wasn't something that went bad. And the fruit--every kind of fruit. First time I ever tasted cherries or even seen a cherry tree was there. Or ever ate an apricot or seen an apricot. Or even apples--we had apples there—wonderful. And the whole valley was full of that. It wasn't just one little orchard, it was lots of orchards. It was covered with orchards and alfalfa fields. Yeah. Bauman: Did you have electricity? Bauman: So you mentioned that there was a well. Is that--how were your crops irrigated with it? Reid: Oh, well, we had sprinkler systems. They weren't like they are now. But what we had, you dug the ditch across the field. And then you made little rows out of that on both sides. And you would run it from the well pipe into that big main ditch. And then you would take the little ditches and close them up. When you've got enough irrigation water, you'd close them back up. And that's what we did. That's how we did it. And that's how they water the orchards. Reid: We didn't have running water in the house. We went out and got it by the bucketful off of the well. There was a little faucet and you could either pull it up with a bucket or you could turn the faucet on. There was a pump. [LAUGHTER] It's the same one you watered the yard with. But it was grand to have all the fresh water you needed because we paid $0.25 a barrel in North Dakota for drinking water because it was a rancid and acrid. $0.25 then was a lot of money. We washed clothes with it. My mother would take it after she washed clothes and scrub her floors. And they were white from the lye in the soap. And then she would put it on her garden. But we never had bugs on the garden. [LAUGHTER]. Bauman: So I was gonna ask you--who were some of your neighbors? Reid: Let me see, Beldins. Beldins were one of our neighbors. Summers were some of our neighbors. And I can't even remember what--his kid's name was--oh, I can't say his name. He kind of talked with a nasal. And my dad called him Snazzy Summers. [LAUGHTER] I don't know where that came from. But anyways, he was--he had a crush on my sister Helen. And Helen didn't like him. Of course, she was only about 12 or 13. I don't think she had boys in mind. She was kind of a tomboy, too. They were some of our neighbors. And we lived-- the Abercrombie place was north of us. And down below us was an abandoned place. And they must have made wine of some kind, because they grew grapes and the grapes were still there. They grew right down to the water. We would go down and get these great big, beautiful Tokay red grapes. And they were right there by the river so they had enough water. But then the whole farm was completely abandoned, probably because of the Depression. I really don't know. But they were the neighboring ones. And the Grewells lived up above us. Helen and Gerald Grewell was their name. And Helen Grewell was my sister Helen's very favorite girl. They’d run around all the time. Reid: Oh, Patsy Borden was my best friend for a while. She was probably my best friend, yes. And she was the granddaughter of the Saths, who were related to the Wiehls who run the ferry. And Ida Mae probably was another little friend. She was a nice little girl. I liked them all. We actually--there wasn't a whole lot of--kids had to go home and go do things. It wasn't--I remember the Kilian children because they were German. And they came there, I want to say about '37, '38. Hitler was already busy in Germany. And they came home. And they Mrs. Supple used to raise sheep. Her and husband--they were German also, very, very German. Nice people, but she thought Hitler was doing such great things over there for the German people. And so Mr. Kilian went over and had a long talk with her and said, you know, you are putting yourself in a dangerous position, because this is not going well in Germany. He might be doing things for the German people, but he has things in mind for the world. And I thought, how kind. How provocative and kind that was. It wasn't necessary for him to do that. He really didn't know them. But he had heard things. And in a little community, things like that get around. It isn't gossip, it's just fear. But I thought that was very kind. I was only about 7, 8 years old. Bauman: --that you had to do on the farm? Reid: Everybody did. Everybody did. Mine was feeding the chickens and gathering the eggs. And we had a little hen named Grandma that mother picked out of the shell, and Billy Rooster, who I guess was named after me. He turned out beautiful. But little Grandma Hen was sterile, so she must have been too weak. But she kept her in the warming oven for an extra couple hours, and she picked her out of the shell. She was sterile. And she would run around stealing everybody else's chicks. She would have a couple of Rhode Island Reds, and she would have a couple of little Leghorns, and maybe a little Barred Rock or two. And she'd huddle them up and boy, she'd fight them off--she's going to keep these kids. Well, Mrs. Sath was such a sweetheart. They lived in the--next to us. And she brought my mother some duck eggs-- white Peking duck eggs. And she said, why don't you just set her. She's dying to and she doesn't know--she'd fight them off. And so they set about 10 eggs under her because duck eggs are pretty good sized. And she hatched out every one, and she was so proud of them. Oh, boy, she'd just stomp around that farmyard like she really knew what she was doing. And she just took them down to the horse trough one time. And they found the horse trough, and they jumped in. And she just went berserk--"come back, come back." And so it got to be a morning thing. Every morning she'd take them to the horse trough because they had to have their swim. But she raised them. [LAUGHTER] Those things were fun things. We didn't have TV. We had a little, tiny radio that we could listen to for the news. But it wasn't a thing you had on all day. But Billy Rooster used to hear the music and he would try to keep up with it. And my sister Dorothy would always do the lunch dishes. She'd say, Billy Rooster, are you out there singing to this music? Reid: It was very wholesome. Bauman: Mm-hm. What other sorts of things did you do for fun? Reid: The river. Oh, the river. The river was a godsend. We learned to swim the first year, the first summer we were there. And we had a raft. The dads had got together and built this big raft. And if you could swim out to the raft—I was not supposed to, but I did. And the little Lowe boy wasn't supposed to, either. He was just learning to swim. And he went under. And my sister Dorothy was a really good swimmer. And he went under for the third time. And she went down and got him, got him out on that--pulled him up. And there was a couple of guys up there pulled him up on that raft and they turned them over on his stomach. And the water just poured. And he lived. But he wouldn't have lived. And every one of those kids at White Bluffs were just as devoted as that to the river. That was our playground. We had to do our work in the morning because it was cool enough. And the summers over there were--boy, they were hot. But we could go in and get in the swimming pool then, our swimming pool. Bauman: You mentioned a little bit ago having a radio. Did you have a telephone also? Reid: We finally did have a telephone. And it was only a dollar a month. That was right uptown. We'd never had one of those before. It was a party line, so if there was an emergency, you had to give up the line. If there was an emergency--if you didn't, they would take your telephone out and you'd never get a telephone again. So that was good and responsible. And I think Mrs. Westling was the telephone--she had it in her home. She and her daughter, I believe, operated it, I'm pretty sure. They lived up by the bank, I remember that. But I can't tell you--we didn't have names on the streets that I know of. Bauman: And so did you get your news mostly on the radio? Was there a newspaper also? Reid: There was. There was a little newspaper there. And I believe it was for Hanford and White Bluffs. And my brother actually worked for that newspaperman. First you start out just because he thought it would be fun. Phil asked him, he said, would you like to know something about publishing a newspaper? And so Dutch went and worked for him. That's what we called him--we didn't call him Virgil. And he went and worked for him. And they did publish a little newspaper. It was a weekly, just once a week. And, of course, they had all the Ladies Aid tea parties, things like that, things at the church. Everything was in there. Yeah, a little gossipy paper. It wasn't malicious. It was just who had a luncheon at their place or whatever. And so, when he got older and came out of the Army, he went and took formal newspapering, went to college and took it. And he became a newspaperman. Boise Statesman was one of them. And he went down to California. And he worked down there for a while, about 10 years there. So that was good for him. Bauman: What businesses do you remember being in White Bluffs? Reid: Well, I remember Reierson's Grocery. And I remember around the back of it was a little creamery where you could--in fact, they picked up a can of cream at our back porch every morning, because we had, by then, two cows. And one was a Guernsey and one was a Jersey, and they both had lots of cream. So we couldn't use all the cream, even for six kids. [LAUGHTER] So they would come and pick that up. And my sister, Helen, always did the ironing. She liked to iron. That was her job. And so he would come, and here she'd be on that back porch, early in the morning, starting the ironing. [LAUGHTER] And he says, I don't think you've gone to bed. He was a kidder. But that was what she did, and she was excellent at it. Reid: I would say that, in my first and second grade class, there was 18 that I can name off, that I can remember. We had a little boy come there named Carter House. And I think his father was something to do with engineering. Allard, Sam Allard kept the irrigation system and the electric thing, and I think Mr. House had something to do with it. But we had never seen a child look like this before. He looked like he stepped out of a catalog. He had this blonde-- beautiful boy-- had this little blonde hair all cut so nice. And he wore little argyle knee socks and little suit pants and a little white shirt and little slaps on his shoes. And I thought, my gosh, that's the cutest little boy I've ever seen. And, of course, he didn't know how to share. And one day I was swinging on the swing, and Alice Moody looked out the window. And here was this little boy grabbing that swing and taking it away from me. And she says, we don't do that here. She says, you have to wait your turn. She says, when Leatris is done with it, she says, you can have it. It'll be your turn. [LAUGHTER] But they were probably nice people, it's just that they weren't White Bluffs-oriented. Reid: Ah, she was a wonderful teacher. Bauman: --grade teacher, is that right? Reid: Wonderful lady. She taught first, second, and, I believe, possibly third. And there was probably, I would suppose, 18 in the first grade, and probably close to that in second. And then there was the third grade. And we had—we did not have separate rooms, but we had little partitions that she would put up so that we would keep our attention. And we did have monitors. Everybody helped everybody. If there was a little boy that needed help with numbers and somebody was good with it, she would assign them to help that child. It wasn't--it was probably the most together community. If something was unfair on the playground, it was put a stop to right away, sometimes by the children. And teachers, if they were in their room, they kept a window open in good weather because if there was anything wrong in the playground, it was either reported or taken care of. And I can't remember fights on school. I can't remember that, ever. It would never have been tolerated. Bauman: --or did you ride the bus? Reid: Everybody walked. The only children I remember that came in on a bus--oh, what was his name—Mr. Fisher's school bus. Mr. Fisher, I believe. And he came in on a little bus--with a little bus. And I think they were probably from out toward Saddle Mountain and farms like that because they had to go to school. But I do remember a little bus. And I don't even remember that it was painted yellow or anything. I think it kind of reminded me of maybe a van. But it had windows in it and it was kind of squared. It seems like it was dark gray. Bauman: Mm-hm. And so far was the school from your home? Reid: Oh, I, let me see. We had to pass Saths’ orchard, the whole length of their orchard, and then Beldins’. And then we had to walk across the front of Beldins’ and their [AUDIO OUT] was pretty good sized. And then we had to walk up past Summers' up the hill to our house. So I would suppose it was probably a mile. And some of them walked a lot more than that. And Mrs. Moody used to bring kids in with her when she came to school because she drove to school. And she was around the Reach, around the--it was last reactor. And Old Town used to be there. The whole town used to be on the river at one time. But they moved it away because I think they were progressing. People were moving in, spreading out. Orchards were filling in. And I think that's why they probably moved the town. But we had a movie theater. We had a movie theater. And somebody from the Tri-Cities came over with a movie. In the summertime, we had a movie once a week, probably in the evening early, about seven. And then, in the wintertime, it was kind of hit and miss whenever they could get over or whatever, I don't know. I can't remember. But we did have movies there. Bauman: Do you remember any movies that you saw over there? Reid: No, I wouldn't remember that. I probably wouldn't even have understood it. But it wasn't anything that was offensive because they didn't do that. Reid: Okay, across the street from Reierson's Grocery, and also across the cross street where the railroad came to fill the cars, that was right across the street from Reierson's Grocery as you come in to White Bluffs. Then there was a main drag. And there was a railroad hotel there, because they had railroad workers that, when they went out to do things to the railroad--the rails out there--they had to have people. And then they also rented to other people if they came in and there was a room empty. And it was right across the street from Reierson's Grocery from this one that's burned off. And behind there was a building. And that's where they had the movie theater. And it was just an old building, I don't know. It had seats in it--not wonderful, but seats. And then they had a balcony on it, too, so that was good. Kids would go up there and of course, you know. One time we had some holy rollers in there that rented it. [LAUGHTER] And they were rolling around on the floor. And my brother and his buddies were up there taking toilet paper, throwing rolls down there. They were all in little--I don't know, rolling around. [LAUGHTER] The Spirit moved them, I guess. Boy, they got in trouble for that. [LAUGHTER] But it was used for a lot of things. If they had a community meeting or something, they'd either use it, the high school or that little building, depending on what it was about. Sometimes it was a farm meeting, or a new spray that was coming out, or what they should do and shouldn't do. Reid: Boat races we had right there. They did not start in Tri-Cities. They started at White Bluffs. It was wonderful. Mr. Kilian used to slice his big watermelons and sell them for $0.05. [LAUGHTER] Pop English used to sell his ice cream cones. Oh, and the Ladies Aid always had something going--cookies or something or a bake sale. And it was just a fun time. And we had a band. We used to gather up a band and have music there. It was pretty good. And in the spring, we always had a little May Day thing. And we had a maypole. And they would twine the strings around it like they do. And we had a program--quite a program--at the high school. And we had one that we were in that was the doll dance. And Alice Beyers was supposed to be the French lady who had the dolls. And so we had these cute little dresses on, little ballerina-type dresses. And she would come around and wind us up. That was the first start of it, and we danced to the tune, the doll dance. [AUDIO OUT] old, old, tune. And each one of us she wound up. And we started dancing. And we would dance around this maypole. And that was part of the program. And we had--oh, I remember my sister had a reading. "I want to live in the house by the side of the road, and be a friend of man," is the way it goes. And each stanza ends with that. And every single--my mother tutored her, her teacher tutored her--and at the end of every one of those stanzas when she got up there, "I want to live in the house by the side of the road and be friendly with men." It brought down the house, of course. Oh, my mother was so embarrassed. She was so embarrassed. [LAUGHTER] So when she-later in life--when she had a beautiful garden and a family of her own, I found that on a plaque that you put out in your garden, an open book with this on it in a plaque form. And it said, "I want to live in the house by the side of the road and be a friend to man." [LAUGHTER] I said, this is for old memories, Helen, and she laughed. She had a good laugh out of that. Bauman: You mentioned earlier your Sunday school dress. What church did you go to? Reid: Well, I think at that--first, we went to the Presbyterian, but then they closed that. But then we went to the little Lutheran church I think was up in back of the bank. And we went there for a while. But my dress was always a mess. I come home with licorice all over it because, of course, I had to stop and take one of those pennies, buy a licorice at Pop English's drugstore. Bauman: Do you remember any other churches in the community? Reid: I do not. I don't remember that there was Catholic church there. I don't remember that there was. Reid: Oh, yes. We had--I don't know that they--they were Johnny Buck's Indian tribe. My brother knew Frank Buck. He had two wives. One was old and had white hair, and her name was Deloria. And I don't remember the other one. But they were fine people. They came in and they would gather fruit off the ground because it was ready to dry. They would catch fish out of that river and smoke it and just grab your nose and want you to go down there and have some. And they were just fine people. They came in usually before cherries--you would see them before cherries--and then you would see them every day out in the orchards. And nobody ever charged anybody for that. They could have all they wanted. And my mother actually learned to dry fruit. And oh, that smelled good, just waft up and grab you by the nose. And they put it in little, thin sheets like cheesecloth. They'd make a rack with willows--make a rack, weave it, and put it between maybe stumps of willows, little tiny seedling willows that were coming up. And they would make these racks. And they would put this cheesecloth over it to keep the flies away. And they would dry it. And they would dry fruit all summer long--peaches, cherries, apricot, apples, everything. And they taught my mother that if you soak them just a few minutes in saltwater, they will not turn brown. And they won't salt the fruit. And so she learned how to do that. And the fish—oh! When they smoked that fish, you wanted to go down there and just have some. It just smelled delicious. They had a mixture they mixed up to put on it so it wouldn't dry it out. And they would take the whole bone out of it. They'd slice it. They take the scale off, the skin off, and the ribs out. And they would place that between these same little cloths and dry it. And they would smoke it from beneath and they'd keep that just really low. Oh, you could smell it all over the valley. You'd just--oh! And it was delicious. They did a good job. And they were interesting. Interesting, interesting people. And you know it was a good [AUDIO OUT] for kids. I remember my brother used go up, 14 or 15 years old, he and his two buddies Leo and Louie Russo--Leo Goodner and Louie Russo- and they'd go up to Saddle Mountain, take a little flour and little baking powder and maybe some salt and some lard. And they'd go up there and stay for a couple days. Nobody thought anything of it. There was a little spring up there and it was always green. And they'd just camp out and snare a rabbit or whatever. They just couldn't--they just loved it. Usually he went in good weather, yes. But we didn't have bad weather in summertime. But you wouldn't let a 14-year-old kid out now, three of them all by themselves? [LAUGHTER] But they had wonderful times. And it was a good place to raise kids, and it was good place to be raised, too. Really good. Bauman: I want to ask you about the sheriff. Reid: Well, he was a deputy sheriff out of the Tri-Cities. And I think the main thing--the office was up in probably Yakima, I'm not sure. But he had two little girls. And Roberta went to school with me. And Loretta came along later. She was younger by a couple of years. But he came to our house one morning, and he--we were just up. Dutch wasn't up yet, my brother. But he said, I wonder, is Virgil up yet? And he said, no, he said, but I'll go get him. He said, what's he done now? And he says, he's sure going to get it if he's gotten into trouble. And he says, now I want you to understand. He says, there's nothing going to be trouble about this, Joe. He says, I want you to go get him up. He says, his two buddies are in my car. And, he says, we're going to do a little favor for some people. And he said, I don't want any repercussions about this. I don't want any questions about it. If I hear of any beatings about this, he says, I will deal with it. And my dad went in and got Dutch up. And he came out and got in the car. He was dressed. And they went up to the packing house, which is right across from Reierson's Grocery. And he says, now, we're going to go get that car, which you pushed down this incline last night and released the brake. And he says, we're going to push it back up that slight hill. It was probably down there about seven, eight blocks. Well, it was uphill, now. It wasn't so easy. But, he says, I'll help you with the brake here. And he said, we'll keep this released. And he said, we'll push this back up. So he got those three boys--probably 14, 15 years old--to push that car about seven or eight blocks up to be iced. And he came home. He was pretty sweaty and he was pretty tired. And he wanted some breakfast. [LAUGHTER] But nothing was ever mentioned about it. And he was a fine man. He knew how to handle people. And he wasn't out there to bully anybody or--and later, he came to a family reunion. We called him up and invited him, because we knew he'd lived in Milton-Freewater, him and his wife. And, of course, Roberta-I kept track of Roberta because she moved here. That was his oldest daughter. And so I was glad to meet them. And we invited him to the get-together. And he mentioned that. And he laughed about it to Dutch. Dutch was a little uneasy when he thought we were going to invite the Beans. [LAUGHTER] And I said, he made a good joke out of it. He says, I've used that a lot of times, he said, on how to and how not to. And he said, you turned out pretty good. He says, turned out pretty good. Reid: Oh, Ellis John was an interesting person. He lived down in old town in just one of the abandoned buildings. He had been on some kind of a merchant ship. And somebody on that ship that worked with him attacked him. And he was beating on him, and he killed him. And so they sent him to a penitentiary. It was a kind of an accidental killing. He didn't mean to but he was really--that's what I got out of it. But he lived there. He came to White Bluffs because it was such a nice little town. He came through there and he liked it. And he was an artist, a real artist. He did pictures of people. And he would make a few bucks, did paintings of them. And when I had my 10th birthday--my mother used to leave vegetables and fruit on his porch because she knew he didn't have a garden. And she always left vegetables and fruit if we had extra--because we always had extra--on his porch because he was kind of a recluse. But he would come out and talk to you. He was pleasant. And when I had my 10th birthday, my folks bought Muriel Beldin’s girl's bike for me to ride. And it was a smaller bike. And he painted roses on the fenders of that blue and white bike. And I had the prettiest bike in town when I moved to Walla Walla. [LAUGHTER] So I always remembered him because I was fascinated with--in fact, I took art in school because I was so fascinated with him. He would sit there and sketch somebody and--right in front of your eyes-- and make it live. And you wondered how he did that. He used charcoal a lot, and pen and ink, and paint. Just-- and I always felt bad because his life was kind of wasted there. He could've been--I mean he could make a likeness of anybody perfectly. But he chose to be there because we accepted him, and we respected his privacy. He had been through a lot. And I don't think he was a murderous person. I think it was something that happened. Bauman: So when and why did your family leave White Bluffs? Reid: Well, in 1937, Hitler was very busy. And by 1941, he was even busier. And in June--in April of 1941, we moved to Walla Walla. My dad says, there's going to be some military. He says, you can bet your sweet life. He says, it's big enough to have some military. And he said, I want to be where there's some jobs. And so we moved to Walla Walla. And there was a veterans' hospital here and he was a veteran. And he said, I just think it'd be better, because they had surveyed our area in 1937, '36 or '37, I'm not sure which. But we kept surveyors at our house, so we knew they were surveying for something. And it took them, oh, a couple years to survey all that area that they were looking at. Reid: They didn't even know what they were surveying for. They were hired by the United States government. And they were employees of the United States government. So we kept Mama and Daddy Redd, we called them. And they were nice people. They had no children, and they just loved us. They just--she taught us really good things, things that we hadn't learned from our mom. Mama didn't know how to make fudge. She'd never had that much sugar to spare in her life. [LAUGHTER] So we all learned how to make fudge and penuche and good stuff from Ma Redd. Reid: I had my 11th birthday here. It was in the spring of 1941. And we didn't have war until 1941, December 7. Bauman: So as a 10- and 11-year-old girl, what did you think of leaving White Bluffs and moving to Walla Walla? Bauman: Did you keep in contact with the people from White Bluffs after you moved here to Walla Walla? Reid: I knew Bonnie Morris was here, and her sister, Ruth--her sister-in-law, Ruth. They were both Morris girls. And I don't think they were sisters. I think they were cousins because we had two Morris families there. But Ruth went to school with my sister Dorothy at White Bluffs High School. And I went to school with Bonnie Morris, who went to White Bluffs Grade School. And I'll tell you what, I was sure jealous of that girl. She could do handstands and cartwheels all around the White Bluffs Grade School and not stop. She could do a flip over and throw herself up and come down on her feet. And I just--I was just amazed. She was a couple years older than me, or I thought she was. But I don't think so. I think she was probably close to my age. She probably--maybe it was one year. But she was a fantastic athlete. Even the boys envied her. I mean, she could just flip around like a circus performer. And here I was, a tomboy, but not delightful with things like gymnastics. There was always somebody we envy when we were kids. Reid: My sister was living there. Bauman: Oh, she was, okay. Reid: She was living in the Johnson place. She said nobody ever came and got the beautiful antiques she had upstairs. She had a teapot that came over on the Mayflower. The legs were--it was a silver teapot, and the legs were actually worn completely off. And it had the Ford name on it. Reid: That was Dorothy, my oldest sister that I love so much. Bauman: And why had she stayed there? Reid: She stayed there because she had husband who was a truck driver. And she was expecting her first baby and didn't really know what else to do. And he was gone. Reid: She met him in Kennewick. 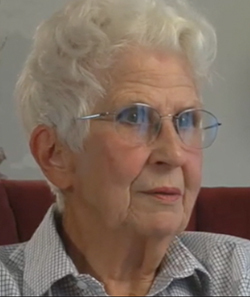 She was working at Kennewick General Hospital at the time. And she met Vern Fouracre. And they got married at our house. In fact, we chivareed them at our house. And that was probably when--I was 13 when I was an aunt, so Colleen was born in '43. And she wasn't born there. She was born—she was pregnant when she was there but she was born after that. And that's when they moved them out. They had to move everybody out. And I always wondered whatever became of Mrs. Johnson's beautiful things, because they were museum things. They should've been in a museum. They shouldn't have been in an attic. Bauman: Right. Where did your sister and her husband go, then, when they had to leave? Reid: Well, they went back to Kennewick. And Colleen was born in Kennewick. Was born in--[AUDIO OUT] Then she came to Walla Walla. And she had a little boy a year or two later. She had four. Reid: We went to the Hanford-White Bluffs picnics, I think, four or five times. And then, of course, the people who were doing the arranging for it--Annette Hereford and I can't remember the other boy. I can't remember the boy. Man off-camera: Bob Grisham, maybe? Reid: I believe, I believe. They graduated high school with Dorothy. And they just were getting too old to do that. And it was hard thing. And people were dying off. But Alice Moody was at the last one. I was, too. And I loved seeing her. And I knew her immediately. She looked just like herself, just exactly. Reid: Mm-hm. We did, we did. We could take our car in. First time, I think they had a bus for people who had no transportation, because the Tri-Cities had--they were old. Some people weren't driving anymore. So they evidently had acquired a bus for some that couldn't. And whoever had room in cars, we took them. But ours was always full because our kids were just fascinated by this. And we went to the dinners, little banquets that we had you. Mr. Reierson was there. Reid: Broke my heart. Just broke my heart. We had a hard time finding--we wouldn't have found where our house was, except there was a water tank associated with this pump. And it set out front. It was made--and a lot of the people had them. Some of them had brick with a liner in it. But this one was cement and was kind of cone-shaped, and evidently was a holding tank for the house, or whatever. I don't know, I'm not sure. But it was there. And that was still there. They hadn't knocked that down. That's the only way--and it set up on a hill. It was the first row of hills as you came down toward the river--dropped down the river to Old Town. And so, that was how we found it. But there wasn't any stumps of trees left. There wasn't anything left. They actually had the crew of conscientious objectors at McNeil Island come down and cut the trees and the wood out of there, and took it back for fuel by truckloads. And that was the last, just before they released--they were already starting to build the reactors and things and dig the systems underneath, and storage thing under the--But it was a wonderful place to grow up, and I don't know that they'll ever get it cleaned up. Bauman: Anything that we haven't talked about yet in terms of White Bluffs, any stories or events that stand out that we haven't had a chance to talk about? Reid: I just think it was the best place to the world to raise kids because there was a community spirit-- that I never saw favoritism. I never saw belligerence about minding rules. I always saw a humanitarianism. If you knew that your husband or your neighbors or anybody was having a problem, you didn't make it your business. You didn't gossip about it. It wasn't a usual. It was more of any empathy, more of a sympathetic, let's just do what we can for them. I never saw the malice toward anybody because they were poor or maybe did something wrong. If there was a wrong committed, it was straightened out and talked about by the two people that did it. And it was left alone. And they had a tavern there. [AUDIO OUT] And, even there, it was not tolerated for people to act like a bunch of savages or fights or--It was a place to go have a cold beer if you wanted one, but I don't remember a lot of drunkenness or--I don't think he would have--Harry somebody was his name. It ended up two people owned it, but I can't remember what their name was. Reid: And we were gone, but they told us about it. And I can't remember, but that was the last of it. And it was just a little tavern. I probably, I don't know--it was probably four or five little tables and maybe a row along the bar. I remember standing out there one time because my dad went in to have a beer with a friend. And I said, well I'll wait out here and eat this ice cream cone from Pop English. [LAUGHTER] I knew what to do with it. He was a fine man. He actually organized the White Bluffs band. Reid: The high school band. And he made room for everybody. Everybody had-- Ola Meeks could do the baton twirl, and she taught two other girls to do that. And they had white pants with a--it's either black or navy blue stripe down the side--and a white shirt, just a plain little white shirt. The girls wore a white blouse. And everybody had a part in high school band. And they went up to Yakima and they took first place. That little-- and competing against Kennewick, Pasco? It was amazing! Somewhere we have a picture, and I don't have the picture. I can't find it. [LAUGHTER] But Dorothy just loved it. She played a drum, and she just loved it. And they did a good job. No, it was a fine place to grow up. And it was sad, because it really was a neighborhood community. And there were people who had plenty, I mean, they had--there were well-to-do people there. But they didn't flaunt it. They were no different when they went to the Grange meeting. Or whether they were entertaining, it was not—there was not any class distinction. And especially at school I noticed it. That's unusual. That's unusual. And we welcomed it. Reid: Well, you use what you can. I know you you'll cut, because, of course, you can't. You have to do what you have to do. But I know that people are going to give you some wonderful stories, stories about how they were accepted. And I'm sure every one of those people that you interview will tell you the same thing, that it was a wonderful community. Bauman: Thanks again very much. I appreciate it. Reid: I appreciate your coming. 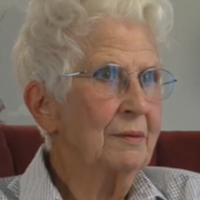 Hanford Oral History Project at Washington State University Tri-Cities, “Interview with Leatris Reid,” Hanford History Project, accessed April 22, 2019, http://www.hanfordhistory.com/items/show/78.